This is a companion article to one, co-authored by my colleague Ed Gabriel and I, concerning recently declassified information on the history of US policy on Western Sahara which makes public, for the first time important elements of Western Sahara history that we both have direct knowledge of, but have not been able to discuss fully in public before now. A further important note, Ambassador Gabriel and I submitted our article to the State Department for review prior to its original publication in American Ambassador’s Live! While the State Department requested that we publish with the usual disclaimer stating that the opinions contained therein were solely our own, readers should also know that they made no redactions to our text. The bottom line here is that the United States made a clear and solemn agreement with the Kingdom of Morocco on how best to resolve the issue in Western Sahara and pledged not to support any other solution to the issue that did not protect Morocco’s sovereignty in its Saharan provinces. That solution is based on our agreement to support negotiations aimed at implementation of broad autonomy for the region under continued Moroccan sovereignty. For its part, the United States also agreed to use its influence to ensure there would be no renewal of hostilities over this issue. Another important revelation in the original Moroccan paper, and highlighted again in our article, concerns the eventual resignation of James Baker as Personal Envoy. Baker had threatened Morocco with sanctions if it did not agree to accept without revision all the proposals contained in his second attempt to table a resolution in the Security Council. 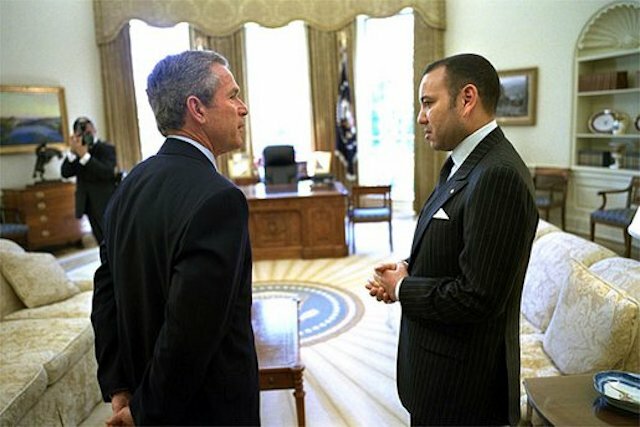 President George W. Bush pushed these threats aside in a landmark meeting with King Mohamad VI on the margins of the UNGA in New York in September 2003 and confirmed that the original bargain between Morocco and the United States made during the second Administration of President Clinton remained the official policy of the US on Western Sahara. That policy was subsequently confirmed in repeated public and private statements during the two terms of office of President Obama, even though no reference was made at the time to the fact that the policy was based on a bilateral agreement concluded between the Kingdom of Morocco and the United States. Now that these facts are all in the open, we are free to draw some public conclusions about developments since the original agreement was reached. The first of these is that the United States, thus far, has been less than vigorously supportive of the bilateral agreement than it could be. Admittedly, during the Clinton, Bush, and Obama Administrations the United States has been faithful in its description of Morocco’s 2007 autonomy initiative as “serious, credible, and realistic.” Indeed, it has also gone so far as to say in both public and private communications that autonomy under Moroccan sovereignty is the only realistic solution to this problem. And while these statements have been consistent and helpful, they have not been backed up with the corresponding diplomatic initiatives to move this solution forward. Words matter, but so do deeds, and this is where the United States has failed to sufficiently support the solution that emerged as a US policy initiative from its own interagency review in 1999. Morocco has made very significant and substantial progress in its efforts to develop the Saharan provinces, politically, economically, and culturally since the agreement was reached – including its initiative to prepare the region for autonomy through its advanced regionalization initiative. Unfortunately, it has had to accomplish this task without assistance from the United States. There have been no public kudos from Washington for these important efforts which are consistent with the Moroccan end of the bargain to accept a wide autonomy for the region. More importantly, there has been no substantial investment in assistance funding for these efforts other than a small program to help develop civil society, which was the initiative of the Congress and was actively opposed by the State Department for several years until Congress mandated the program by law. This hardly represents a spirit of voluntarism in pursuit of our commonly agreed policy to resolve this issue. I have called attention to this shortcoming in US policy on Western Sahara many times in the past and made numerous suggestions about what the US could be doing to promote more effectively the policy option it agreed with the Kingdom of Morocco. It is now time for the US to commit itself with greater resolve to a policy that has not changed for the last 20 years. That should begin with a clear and public statement from Washington that US policy on Western Sahara is to support a broad autonomy for the region under continued Moroccan sovereignty. This is, after all, the policy. This was the right policy choice when we made it in 1999 and it remains even more the right choice today. So let’s stop the half measures and put the full weight of our international diplomacy and bilateral effort, including appropriate targeted assistance programs, behind our choice.